I parked at a lay-by with enough room for three or four cars at L81226 56960 B on the R334 Recess to Kylemore Lough road. I headed across the road to the fence at the base of Knockpasheemore referred to by murphysw in his comment on Benbaun. I followed the fence a couple of hundred metres to the right until the fence ceased at a stream, which gave an opportunity to get around the fence. I then headed back SSE for about 1km, which gave me a chance to warm up while gaining gradual height. The walk from the fence was dry enough, but there was evidence in places of how difficult and boggy it could be after a spell of bad weather. At about L81282 56261 D I turned W for a direct 200 metre haul up to the summit cairn at L80691 55737 E.
Besides the mountains visible as mentioned by Simon3 and ahendroff, there were great views all the way over to the Mweelrea’s, the Sheeffry’s, the Ben Gorms and Maumtrasna. 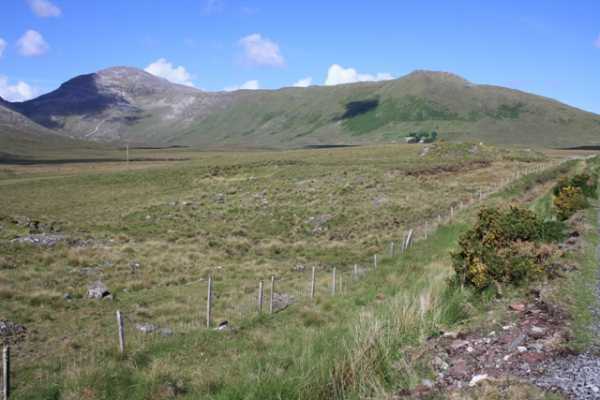 However while heading for Benbaun along the Knockpasheemore ridge, the best views are directly across the Gleninagh valley to Bencorrbeg, Binn an tSaighdiùra, Carrot Ridge and Bencollaghduff. Their sheer grey cliffs and massive drops to the valley below left me in awe. The Knockpasheemore ridge stretches for about 2 kms from Knockpasheemore at the NE end to the start of the climb up to Benbaun at the SW end. The ridge is mostly heathery and boggy, and I saw one place where presumably a sheep farmer had fenced off a nasty looking area of marsh. However with the recent good weather the ridge was quite dry and very little avoiding of wet ground was needed. There are stone cairns at intervals along the centre of the ridge which would be useful navigation aides in poor weather. However the ridge is wide (100 metres at the narrowest) so staying away from the edges shouldn’t be hard). It was interesting to see how suddenly the terrain changed from heather to rock at the start of the climb up to Benbaun. The ground changes literally over the space of about 30 metres, and then it’s a haul of 270 metres ascent over mostly boulders and scree up to Benbaun. The only other thing I can add for Knockpasheemore is that a local man told me that there is a line of standing stones on the southern side of the ridge, but I didn’t see them on my route.